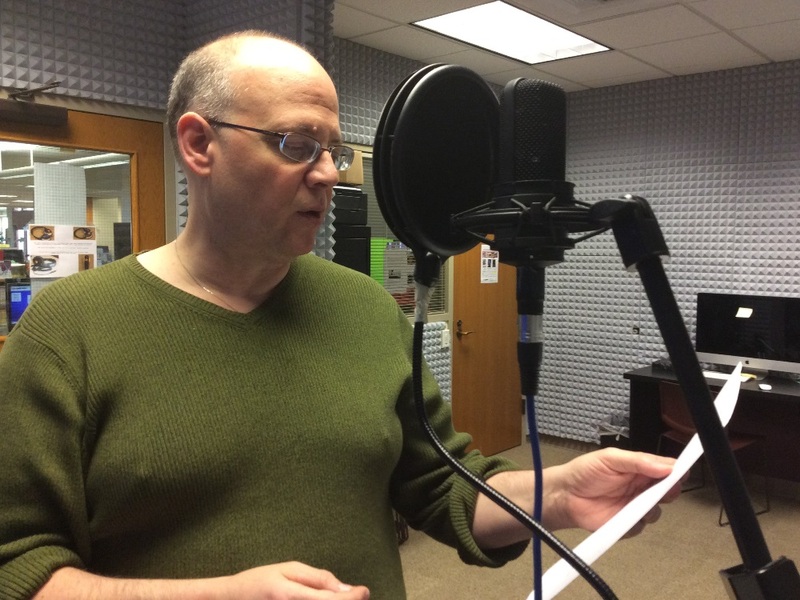 2013-15 Tacoma Poet Laureate Lucas Smiraldo records a poem for the Laureate Listening Project. The City of Tacoma and Tacoma Poet Laureate Lucas Smiraldo are proud to announce the launch of the Laureate Listening Project. 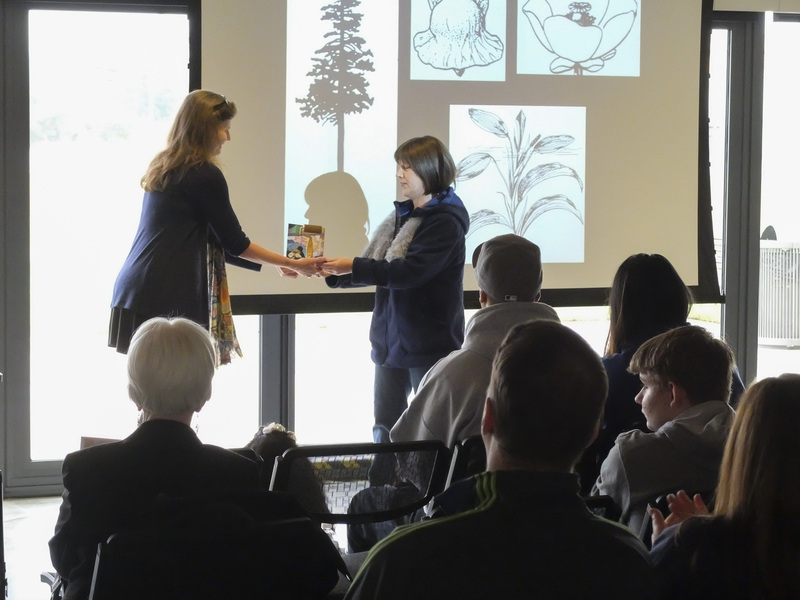 In this interactive online audio anthology, community members from Tacoma and greater Pierce County reflect on the importance of a particular place in their own life through poetry. 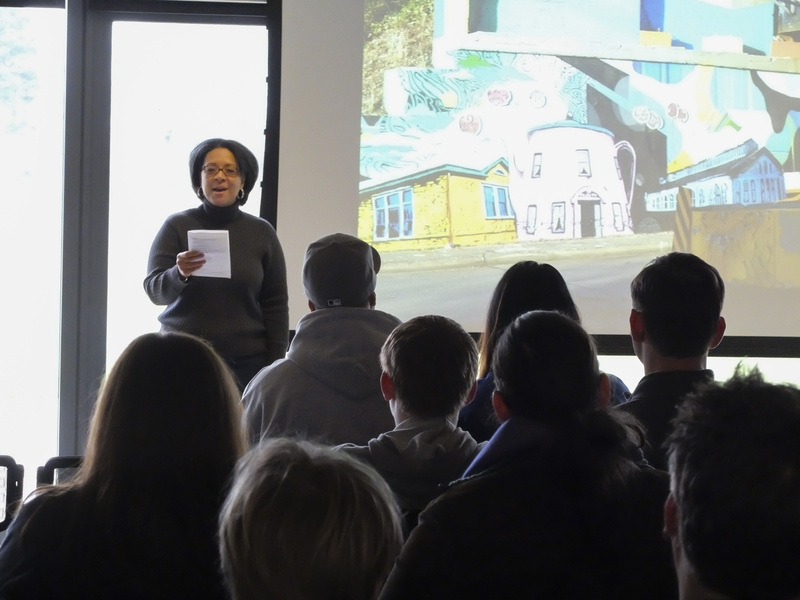 Audio recordings of these poems, centered on the “spirit of place” theme, are linked to a Google map so users can search by a particular poet or location and listen to work inspired by the site. Smiraldo worked with various nonprofit and cultural organizations including the Tacoma Public Library, Peace Community Center and Peace Lutheran Church, Northwest Leadership Foundation, The Conversation, B Sharp Coffeehouse, The Center for Spiritual Living, The Greater Tacoma Community Foundation, Puget Sound Poetry Connection, and Smiraldo’s own monthly event, Live at the Auricle, to record poems from a diversity of Pierce County residents. Currently, the Laureate Listening Project hosts over 55 poems. Additional poems will be added periodically. 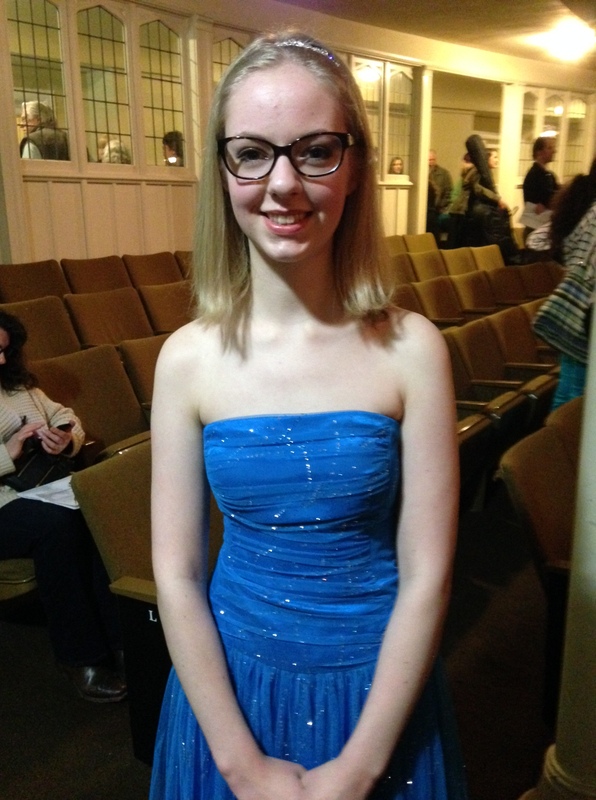 Smiraldo will host an open mic to showcase alumni of the Laureate Listening Project on March 20, 7 p.m., at B Sharp Coffeehouse (706 Opera Alley). At least 30 alumni will share their poems from the project during this free public event. The Laureate Listening Project and additional information about the Tacoma Poet Laureate program is available at cityoftacoma.org/poet. Individuals who are interested in having their short spoken works included in the project can contact Smiraldo at vanillasoul@clear.net for more information and to schedule a recording session. The Laureate Listening Project was conceived and organized by Smiraldo in collaboration with the Tacoma Arts Commission. 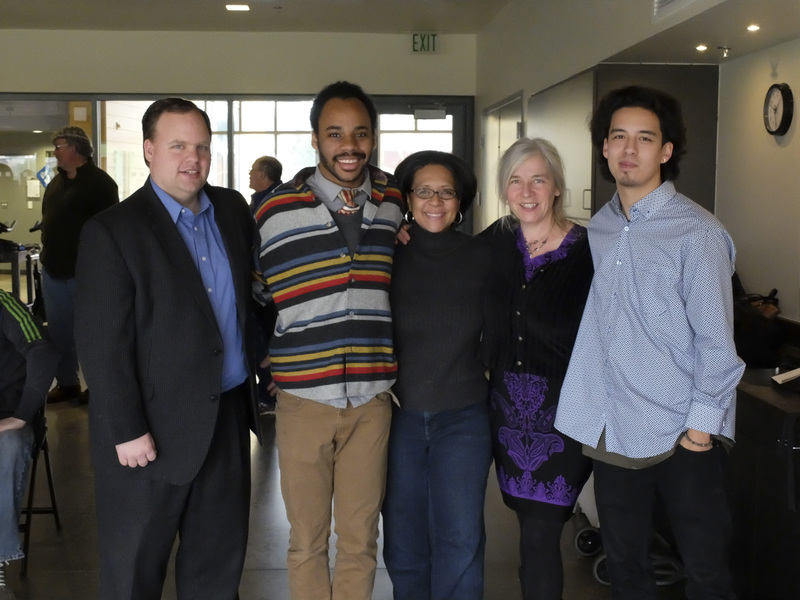 Funding for the Laureate Listening Project is made possible by a Spark Grant from The Greater Tacoma Community Foundation. Mapping capability is made possible by the City of Tacoma. The Tacoma City Council is looking to fill one At-Large position on the Commission. The Commission provides leadership in supporting and enhancing the arts for the benefit of the City and its residents. 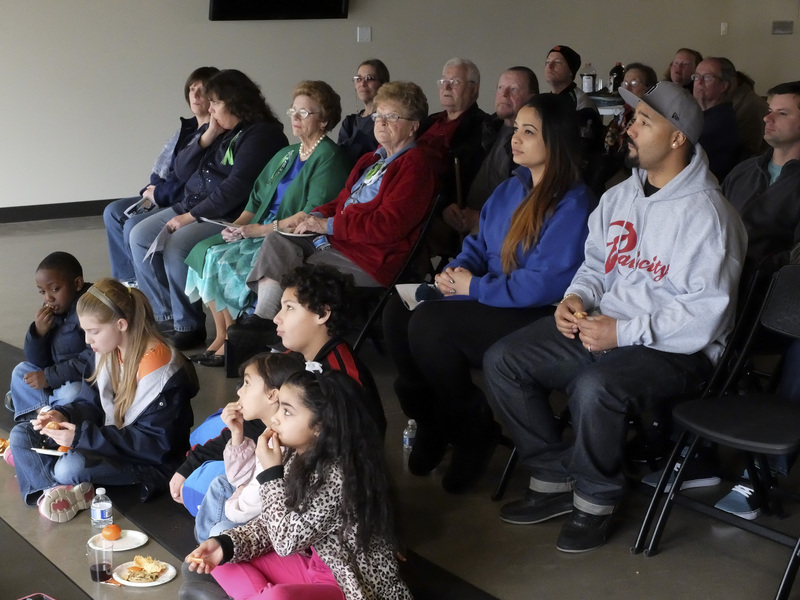 Its purpose is to develop, support, coordinate, sponsor, and present the arts on a year-round basis for the benefit of the residents of Tacoma. The primary responsibility of the Commission is to create policies to support the ongoing development of arts programs and projects in Tacoma. Its primary programs include the funding of artists and arts organizations to provide services for the citizens of Tacoma; oversight of the Municipal Art Program; and supporting programs such as Spaceworks Tacoma, Tacoma Arts Month and the Tacoma Murals Project. The Commission’s functions are outlined in Chapter 1.28A and 1.28B of the Tacoma Municipal Code. Applications must be submitted to the City Clerk’s Office by Friday, March 13, 2015. To apply, please visit cityoftacoma.org/cbcapplication or contact Nicole Emery at servetacoma@cityoftacoma.org, (253) 591-5178, or the City Clerk’s Office, Room 11, Municipal Building North, 733 Market St., Tacoma, WA 98402. 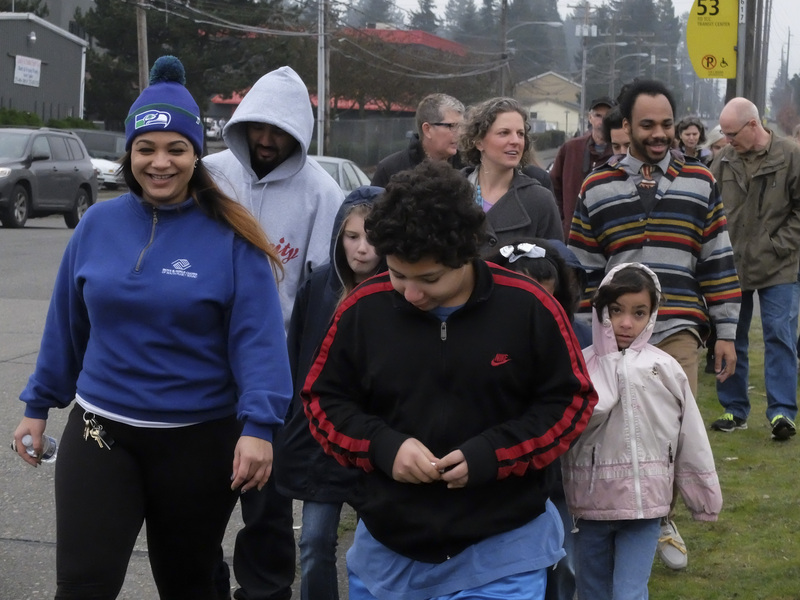 On January 31, about 50 community members gathered in South Tacoma to dedicate the new multi-media mural, Manitou Trestle, created by artists Claudia Riedener, Chris Jordan, and Kenji Stoll, for the South 66th Street Trestle. The public art piece is a project of Sound Transit’s public art program (STart) in collaboration with the City of Tacoma’s Public Art: In Depth artist training program. 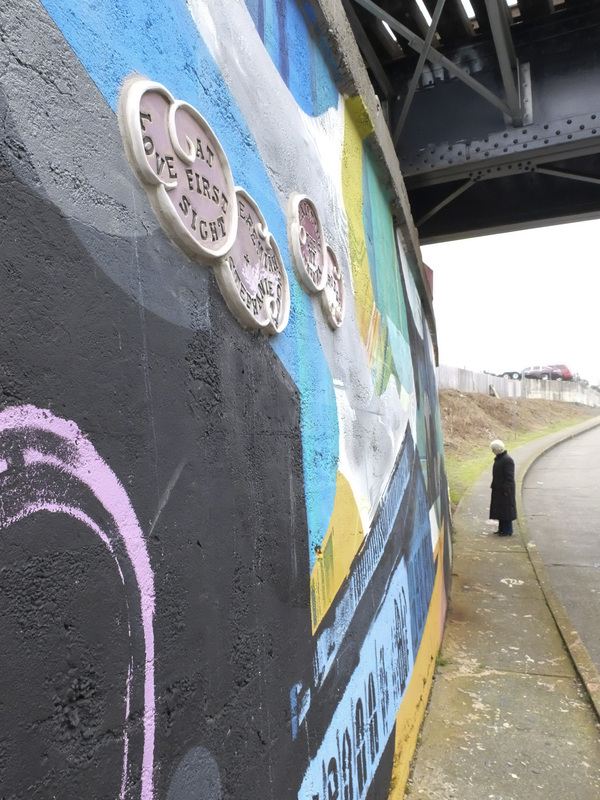 The mural layers South Tacoma’s history, industry and personal experiences with botanical representations of native flora, topography and quotes from the community. 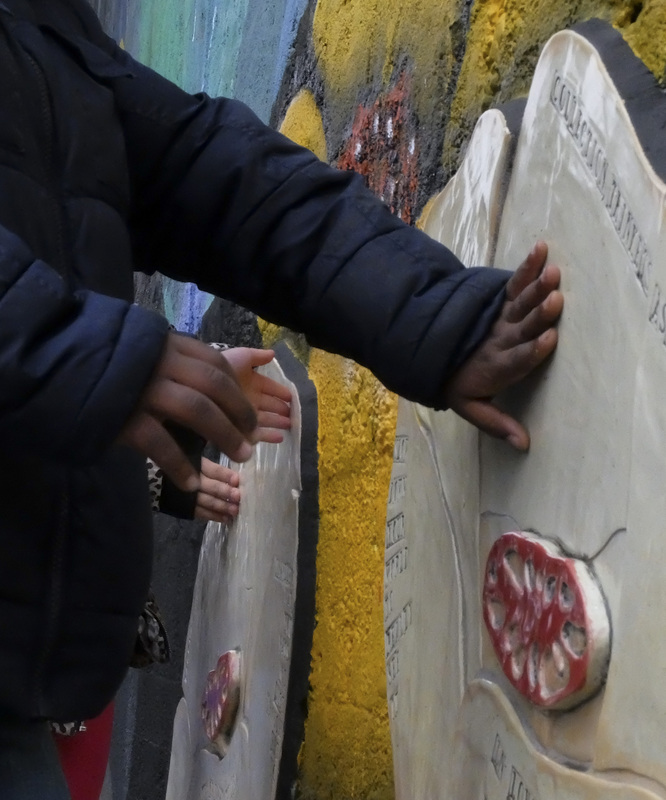 These layers of ceramic tile and paint create a dynamic and collective representation of the community’s memories and tell a visual story of the South Tacoma neighborhood’s past, present and future. 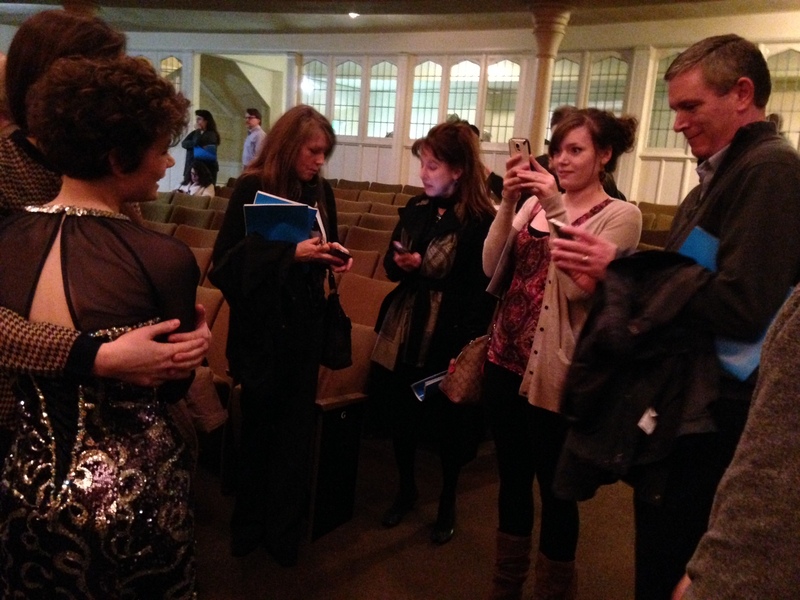 Photographer Dane Gregory Meyer captured the event through the following photo essay. Community members gathered at the STAR Center for the artwork dedication. 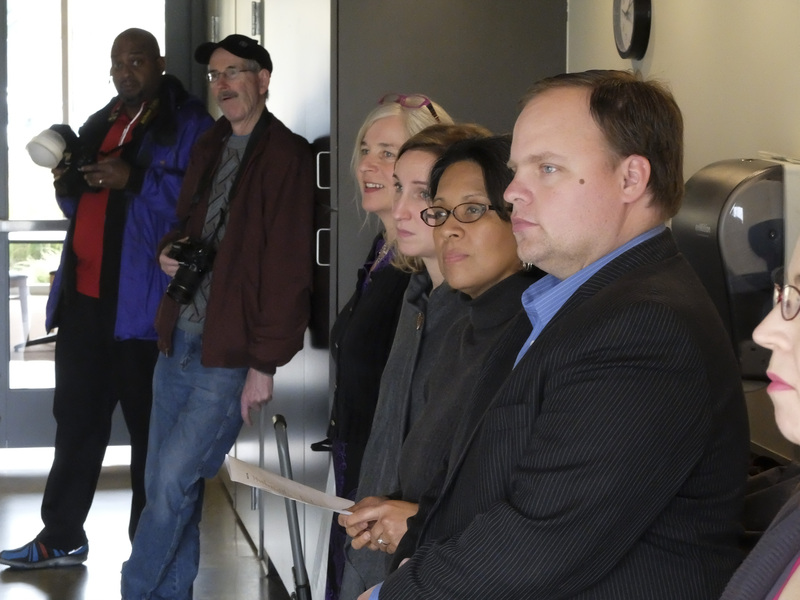 During the dedication (left to right): Claudia Riedener, artist; Chelsea Levy, Sound Transit; Marilyn Strickland, Mayor of the City of Tacoma; and Joe Lonergan, Tacoma City Council member. Barb Luecke, Sound Transit Art Program Manager (left), presented the Golden Roller community stewardship award to Venus Dergan (right). 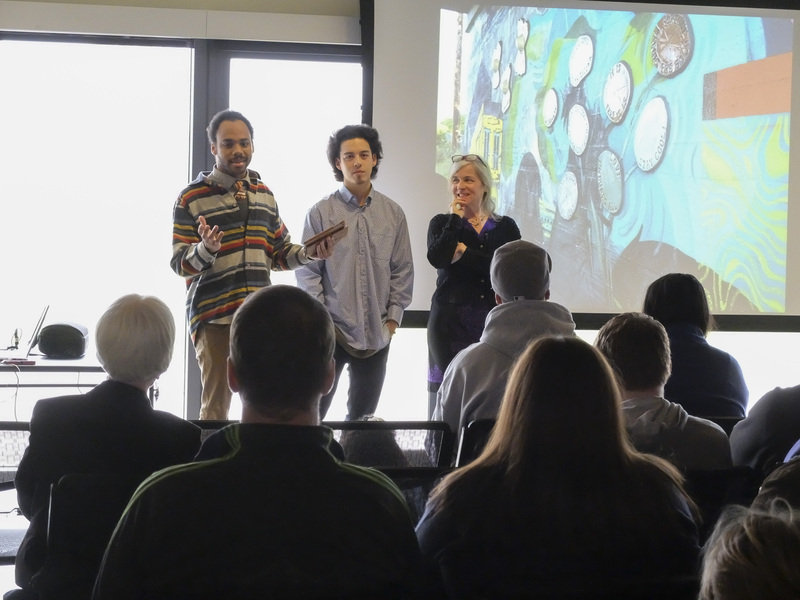 Artists Chris Jordan, Kenji Stoll, and Claudia Riedener (left to right) talked about the inspiration for the mural. Left to right: City Council member Joe Lonergan, artist Chris Jordan, Mayor Marilyn Strickland, artist Claudia Riedener, and artist Kenji Stoll. 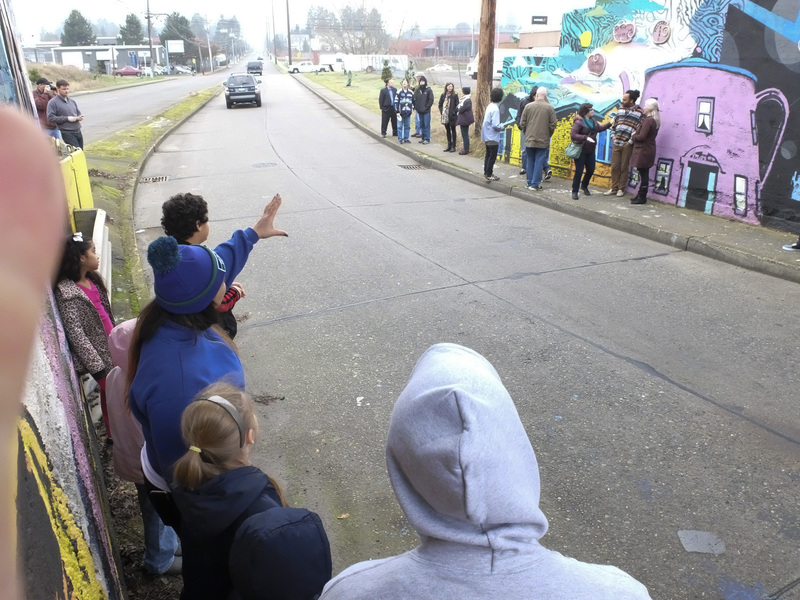 An enthusiastic group of attendees visit the mural site after the dedication ceremony. 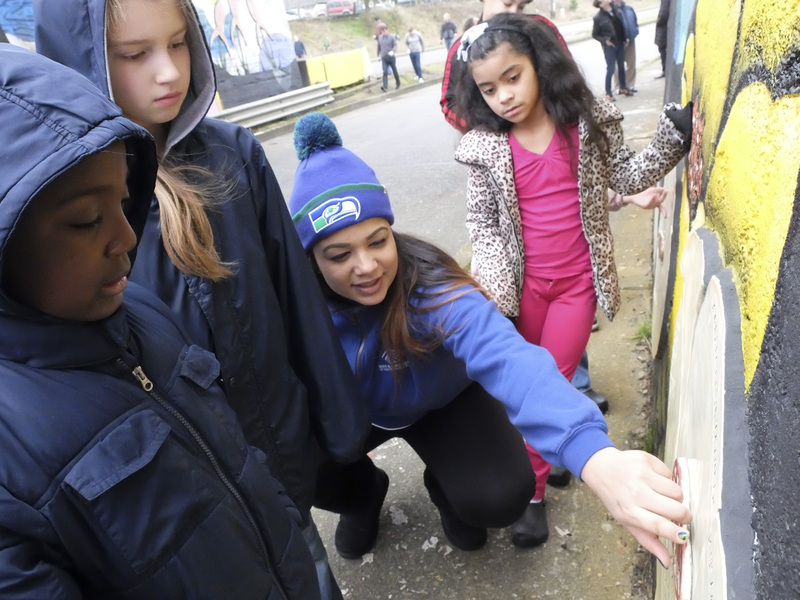 Echo Curry and children from the Henry T. Schatz branch of the Boys and Girls Club inspect the mural they helped influence. The mural is composed of botanically-inspired ceramic tiles, stamped with quotes collected from the community, layered with historic buildings and topography of the land as illustrated through aerosol paint. 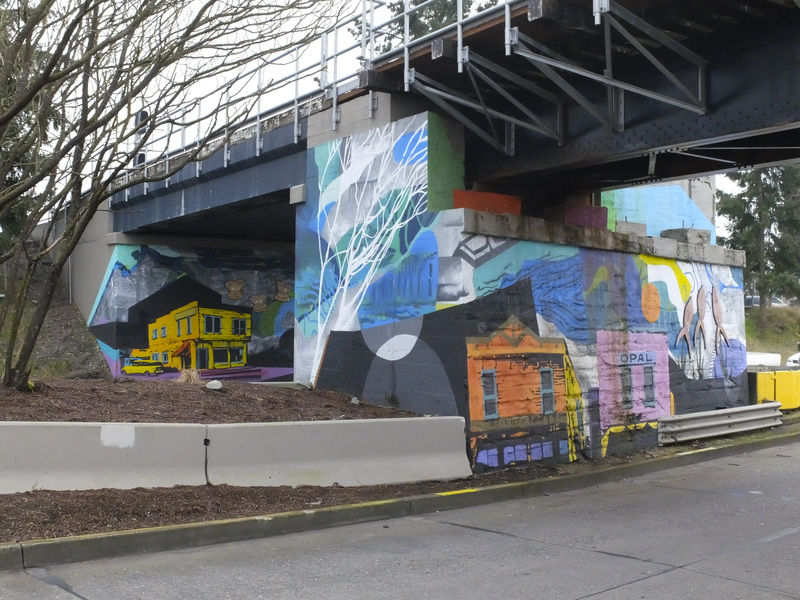 A view of the expansive mural, which covers the north and south sides as well as the median of the train trestle. Dane Gregory Meyer has been a professional photographer for over 25 years and owns Dane Gregory Meyer Photography. 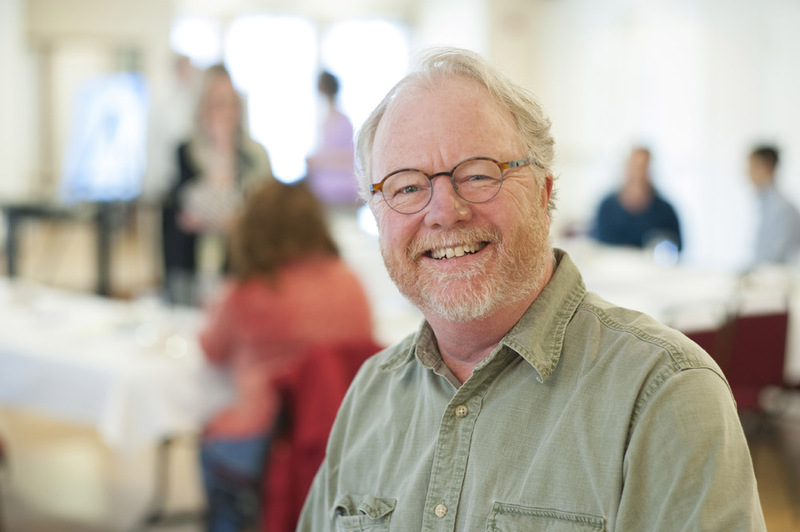 He has served on the Tacoma Arts Commission since 2009, currently as Vice Chair, in a desire to give back to the community and support the arts as an economic engine and core for Tacoma.